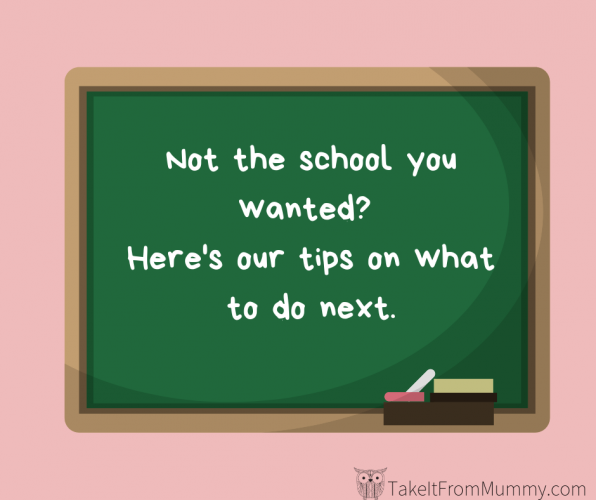 If you didn’t get the school you wanted this time round, don’t worry, here’s some of our top tips. Click here to see the breakdown of Reception places offered this year, this will give you a good indication of what the waiting lists will look like. Don’t decline a place yet, whatever you do! This leaves you without a choice and you could eventually be left with a school even further away or even less suitable. If you accept a place you will still remain on the waiting list for the schools you wanted above the allocated school. For example, if you’re offered your third choice, you’ll remain on waiting list for your second & first choice – make sure this is the case when you contact admissions. 1. Call admissions (Warwickshire School Admissions 01926 414143 ) and check all the information they have for you is correct, mistakes can be and sometimes are made! Then find out exactly where you are on the waiting lists for your preferred school/s, (you can move up or down on these lists). 2. Find out what your exact distance is from your preferred schools in a straight line (Admissions can also give you this info). Write that down. 4. Don’t panic! We got into our preferred school (despite a failed appeal) from a waiting list where we were 19th, there is always hope and there’s so much movement in the first few days. Many parents in this situation tell us that they were eventually really happy with the school they were allocated, though we know this isn’t often the case if you haven’t been allocated a school where you have a sibling already there. 7. If you get to appeal stage, write a speech and read it out. I felt this helped so much when I was trying to talk through tears. Please note: there is a discrepancy between the admissions website criteria and the criteria on the offer breakdown .. the following info is from the offer breakdown but you can see the link here says slightly different. There is however this criteria specified from 2020-2021. The following criteria have been used where schools have received more applications than there are places available, after children with an EHC Plan have been admitted first. a) Children with a Statement of Special Educational Needs or an Education, Health and Care (EHC) Plan that names a school will be admitted first. In this event the number of places that remain for allocation will be reduced. b) Children attending, or with a place at, a nursery class do not have a higher priority for – and are not guaranteed – a place at the attached primary school. c) * Time of admission relates to the time the applicant would start at the school – not the time of application or offer. a) Children with a Statement of Special Educational Needs or an Education, Health andCare (EHC) Plan that names a school will be admitted first. In this event the number of places that remain for allocation will be reduced. b) Children attending, or with a place at, a nursery class do not have a higher priority for – and are not guaranteed – a place at the attached infant school. Here’s the breakdown of school places this year, by school, in Warwickshire, you can see if you’re likely to get in and where there’s space. This can be useful to see how likely you are to get a place, though obviously these change year-on-year due to birth rates and other variables. Appeals received after 3 June 2019 will be heard by Monday 6 September 2019 where possible, or within 30 school days of the appeal being lodged. Primary school on time applicants: hearings will commence on 18 June 2019 and finish on 16 July 2019. No appeals will be heard between 31 July 2019 and 16 September 2019. Posted on April 15, 2019 by Nikki. This entry was posted in Family Information and Baby Health Clinics Warwickshire, Nikki's Night Time Blog and tagged admissions, not the school you wanted, school admissions, school appeals.